This week’s carnucopia includes: real estate, pulling the other one, a fallen face, a driveshafting, a carfinder and many more to keep you on the road to happiness and fulfilment. Looking to sell or exchange my 60k mile 2008/58 Mercedes E320CDI estate. I have spent over £2k on it in the last 12 months. I like the luggage room and power but do mostly local mileage and holidays in the UK. What would you recommend? I’ve seen a Skoda estate 4x4, but know nothing about them. With part-ex I can spend a max £30k. £25k gets you an excellent Skoda Superb 1.4TSI 150 estate: honestjohn.co.uk/road-tests/skoda/skoda-superb-2015-estate-road-test// £25k-£30k gets you an outgoing model used Mercedes E Class Estate or used current model C Class estate. Like yours, the E Class has rear air-ride which is optional but recommenced for the C Class. Take your pick of engines. A C200 is a 1.6. All the others are the old MB 2.1 4 cylinder, or the same 3.0 V6 as in your present car. My daughter needs a car to tow her horsebox. She currently has a Toyota RAV-4 Diesel, but because her day-to-day mileage is low, she is having regular problems with the DPF. This has been replaced once but still causes problems, I'm guessing because of her low urban mileage during the week going to work. Can you suggest an alternative that is just as capable as a tow-car? Maybe it should be an automatic as she has just had the clutch and dual-mass flywheel replaced, caused, I suspect, by clutch slipping when reversing the horsebox. The horsebox is an Ifor Williams with a gross weight of 2,600kg; unladen 920kg. I don't think that the 2000kg towing limit for her 6-speed RAV-4 is exceeded as the two horses weigh roughly 800kg. Admittedly, it comes close. I guess that diesel is still the only viable power source and that she will have to ensure that she takes any diesel powered vehicle on a "DPF regeneration run" on a regular, perhaps monthly, basis to ensure that regeneration takes place. I note from your website that the RAV-4 is on the list of DPF problem cars. What would you suggest as a better, potentially more reliable alternative. Are pick-ups any better? She'll have to drive it a lot more. A KIA Sorento 2.2 manual makes a good choice with a towing weight of 2,500kg (The auto only pulls 2,000kg). The new Jaguar F-Pace 3.0 V6 supercharged or 3.0 V6 diesel autos can pull 2,400kg, but cost over £50,000. Pick-ups, with the exception of the VW Amarock, tend to have a greater towing weight of 3,000 - 3,500kg. But a 'regeneration run' once a month won't be enough. All apart from the petrol F-Pace need regular runs of at least 20 miles. I need your help regarding a penalty that I got from tfl.gov.uk. I'm confused how to handle this situation. On 12-2-2016 I was returning back from the job while I stopped on a red line just for 2 minutes to buy cigarettes. I'm 100% sure that it wasn't more than 2 minutes. When I came back the agent was standing there in front of my car I told him that I was buying cigarettes but he didn't listen and gave me a penalty. I wrote to the tfl.gov.uk but didn't get any response. After 10 days I received a multiplied penalty and it's now £195. I'm working only 3 days a week and can't afford this penalty. I need your help. You are not allowed to stop on a red line at all and you were caught ‘red handed’, so the only advice I can give you is to pay the fine. I attach a photo of my 2012 KIA Picanto. Staggeringly the bumper fell off as we drove slowly into a private driveway. No explanation from KIA customer services as to why this might have happened other than assuming we managed to hit something hard enough to pull it away from the body, which is not the case. KIA warranty division claim it is not a warrantable issue. The very fact that this could happen in my opinion is both dangerous and a defect. I feel that they are not taking my claim seriously. Any help would be appreciated. The best explanation I can think of is that something reversed into it while it was parked, breaking the fixings but leaving the valence assembly in place. Later, as you drove the car and entered the driveway, a slight bump caused the fixings to give way. Why would the driveshaft break on a five-year old Volkswagen Touran, bought second hand, and owned for one year, used only for city driving? The car was serviced in January by a registered VW dealer, including complimentary health-check that gave the drive shaft a 'green light' review. The driveshaft broke two months later. That's unusual. Could be because the clutch has been let out when the wheels were at an extreme angle (by a previous driver) and that weakened the CV joint. Are there car brokers who will source second-hand cars on behalf of a client? Matt Murphy at http://www.londoncarbrokers.com/ But obviously rules apply. If you commission a car to be bought for you at auction, the buyer is acting as your purchase agent and you have to pay for it. In spite of an annual oil change with fully synthetic oil and only completing 44,000 miles since 2001, the turbocharger on my BMW 530 DSE has just failed. Do you think I have grounds for complaint either to BMW or the oil manufacturers? I checked to make sure that DH meant ‘2001’ and not ‘2011’. He did. The car is 15 years old. So we have to take this as a spoof. My Toyota Auris 1.6 petrol auto is now six years, 60,000 miles, and out of warranty. I will replace it soon with a new car. Something medium size, high-sit. My wife hates the "lurching" of this single-clutch auto, so next will have to be either CVT type or DSG type. I'm worried about reliability of a DSG with two clutches wearing out. Any info? The DAF 300 CVT autos that I had many years ago were noisy and very unreliable (expensively so). How reliable are modern CVTs? DSGs, s-tronics and Powershifts have a terrible reputation. One report of a failed EDC on a Renault (replaced immediately with no quibble). No reports received of problems with the FIAT/Alfa Romeo system or the Hyundai/KIA DCT, but possibly better to steer clear. Also avoid Nissan CVTs. On the other hand, Honda and Toyota CVTs seem to be okay, while less fuel efficient torque converter automatics remain by far the longest-lasting and most reliable, but all automatic transmissions with 6-speeds or more need a fluid and filter change every 4 years. All Mazdas, all BMWs, some Hondas, and Mercedes from C Class up have torque converter autos. Someone backed into my car, witnessed independently. A repair quote was sent to them Recorded Delivery two weeks ago. No one at home to sign and still the case. How long is it reasonable for me to wait for their reply and is it sensible if I go ahead with the repair, having informed the other party in advance, then claim in the Small Claims Court? You don't even know that he really lives there. So first you have to check the registered keeper of the car using: https://www.gov.uk/request-information-from-dvla/ If that checks out, send a final notice warning that if no reply is received you will have your car repaired and then sue for it via the Small Claims track of the County Court. I am exchanging my 2012 Honda Jazz 1.4iVTEC manual for a 2015 Honda Jazz 1.4iVTEC EX automatic, which is to be adapted with hand controls to enable my husband to drive now that he is disabled. This means we can share the driving again. When I bought the 2012 car, I independently bought a steel spare wheel (used once) as the Jazz did not have a spare wheel. The tyre size is 175/65R15. The 2015 jazz has a different tyre size: 185/55R16. Would I be able to use the 175/65R15 as an emergency spare wheel should the need arise on the 2015 Jazz? The car salesman felt that it should be OK but, as safety is always a priority, I would value your opinion. Yes. The spare wheel of our 2nd hand 2010 same shape Jazz in Thailand is that size despite it coming on 17 inch aftermarket wheels with 205/45 R17 tyres. The rolling circumference of your 175/65 R15 will be very close to that of the 185/55 R16s for temporary use. But you will need to find a means of safely securing the spare wheel in the wheel well. The parts are available and are fitted in other Honda markets. It seems that the new SEAT Ateca will be the latest SUV to have a petrol 4WD option available on the continent, but not for sale in the UK. Given recent events, isn’t this a bit strange? I wouldn’t be surprised if the same things happened with the new Tiguan as well. I doubt SEAT’s decision is cast in stone. The new VW Tiguan is being offered with an alternative 180PS 2.0TSI engine combined with the new twin-oil-clutch 7-speed transverse DSG and four-wheel drive. VAG is already doing petrol versions of its Caddy and Transporter vans because they are easier to convert to Wheelchair Accessible Vehicles. SEAT might think the 4WD market is predominantly diesel and the fleet market definitely is. But the fleets are all set to catch a cold (and maybe flu) when they find the public won't buy their diesel cast-offs at the residual values they predicted. The one thing you can be sure of is that things are going to change. I have been offered a 2007 BMW 318, top of range, full BMW service history 58k miles, car at a very good price but it has had a Cat D repair. How serious is Cat D? Who inspects the Cat D repair to ensure it's been done correctly? Should I consider this? Can you help me with my 2006/56 Alfa Romeo 159 Sportwagon 1.9 JTDM 16V, as it has developed an electronic/electrical fault that I'm at a total loss with. When I place the car key fob into its slot in the dashboard, many times the car fails to 'see' the fob. This is the same for both fobs, each with new batteries. All other electronic functions that the fob operates work fine (opening and locking the car, boot and dropping the windows, etc.) but I can be sitting in the car sometimes for over 10 minutes pushing the fob in and out of the dash until eventually it clicks, the fob and car communicate with each other and the car bursts into life allowing me to drive it. This recently become so bad that I now drive around with one fob permanently in the dash and therefore 'live', while I have my other fob in my pocket to open and lock the car, switching the car on and off with the Stop/ Start button. This works well but leaves me vulnerable to theft etc, so I'm using a steering wheel security device to immobilize the car. Why does the car not 'see' the fob? And, more importantly, is there a fix? It’s a great car to drive. Communication with the engine immobilizer is different from opening the doors and de-activating the alarm. But this can be fixed by a specialist as they can now interrogate the ECU for the security codes via the OBDII port and either start the car directly or code a key to start it. Google ‘Alfa Romeo immobiliser problems’ or take it to an Alfa dealer. My insurance brokers, Surety, who act for IAM members, want to increase my insurance premium by 61%. I am 81 with no claims. The car in question is a 2013 BMW 320SE X-Drive Touring. They are saying, I think, that Adelaine Insurance is no longer operating through brokers and Surety has to use the open market. I am not 100% sure of the last paragraph. Who would you recommend as an alternative, bearing in mind my age? My daughter has the choice of buying either a 2006 Hyundai Tucson 2.0 CRTD CDX, or a 2006 Honda CR-V 2.2i CDTi Sport station wagon. We’ve not viewed either yet, but they are both low mileage, good service histories and similar prices (the Honda is a private sale). I’m guessing that you will favour the Honda (and so do I), but my daughter prefers the sexier black/leather Tucson. Are there any big issues with Tucson? What would be the advantages of the Honda? That model Tucson has a good interior with proper folding rear seats and maybe handled a bit better than the square-rigged CR-V. But it drinks diesel (34.3mpg in Real MPG v/s 40.8mpg from the Honda). The sound system was found to be defective on my Audi A6 S-Line Avant after being returned by the Audi dealer where it had been in for repair of a central locking defect. The dealer says it’s a faulty amplifier unit and that it's a coincidence it failed after coming out of their workshop. He says he has a replacement in stock but it will be £1,800 + VAT. Surely this is hugely excessive? What can I do? The fault results in no sound at all and inability to use the hands-free phone. Maybe you don't know, but you might have experience of others who have contacted you in on this subject? No one has prior to you. If they had, it would be here: honestjohn.co.uk/carbycar/audi/a6-saloon-2011/?section=good/ Everything is databanked in /carbycar/ so anyone can check up on anything, which you are always welcome to do. I’d get it checked by an independent car audio repair specialist. I saw your reply in the Telegraph today about Michelin CrossClimate all weather tyres. I have a 2014 BMW X5 with 255/50/R19 runflats that will need changing in about 2 months time. I’ve been onto Michelin but they say they don’t make this size of CrossClimates as run flats. What do you suggest for a good replacement tyre please, quiet as possible ride, good economy etc? Probably Nokian Runflats. They do 255/50 R19 107 V XL and WR SUV 3 winter runflats. Michelin may eventually start making CrossClimate runflats, but I don’t know if the type of rubber used is compatible with the construction of these tyres. 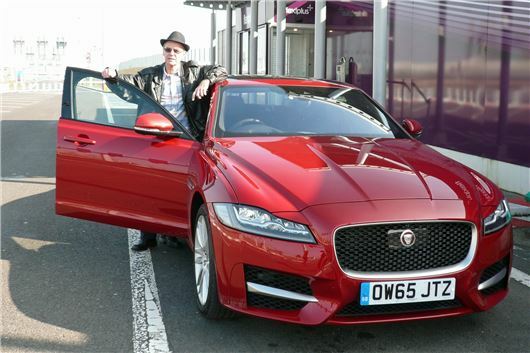 At present I have a Jaguar X-Type Sovereign, but I'm thinking of changing to the XE. My problem is confusion about the merits of diesel/petrol. I currently do 12,000 miles on long, medium and short journeys. Also, what wheel sizes and tyres would you recommend? I wonder if you have any experience of a problem I have had with my Honda CR-V Bluetooth and my mobile phone connection. I recently drove 230 miles to Cornwall and left the car in the drive for 10 days, only using it twice to go to get the papers from the local shop about 1/4 mile away, after which the battery was totally flat. I had a new battery 6 months ago. I called the AA and they found no fundamental fault having checked courtesy lights, etc. and charged up the battery and found the battery to be sound. I suggested that it might be that my phone (indoors) and the parked car were close (about 15 feet) and that perhaps that that might have caused the battery to have drained. I Googled the problem and it did seem that this could be the answer but the AA guy said that Bluetooth doesn't draw that much power. I have "disconnected" my phone from Bluetooth to see if it makes a difference. Any thoughts? If the Bluetooth system in the car continually searches for and connects with a phone it will drain the battery. But your two short runs to get the paper will have done more harm by draining the battery for the cold starts and putting nothing back. Less than a mile, I'd have walked (unless it was raining).